Our internal combustion engine (ICE) was on its last legs, or wheels if you want to get technical about it. 17 years of diligent driving the very reliable Ford Focus 1.8 petrol Zetec into the ground had taken its toll on the machine and it started to become unaffordable to repair and service. As you would expect we came to the conclusion that we couldn’t stretch the life of our ICE any longer. We’d considered ditching the car altogether, or car sharing with a friend, but after some deliberation neither were suitable alternatives. 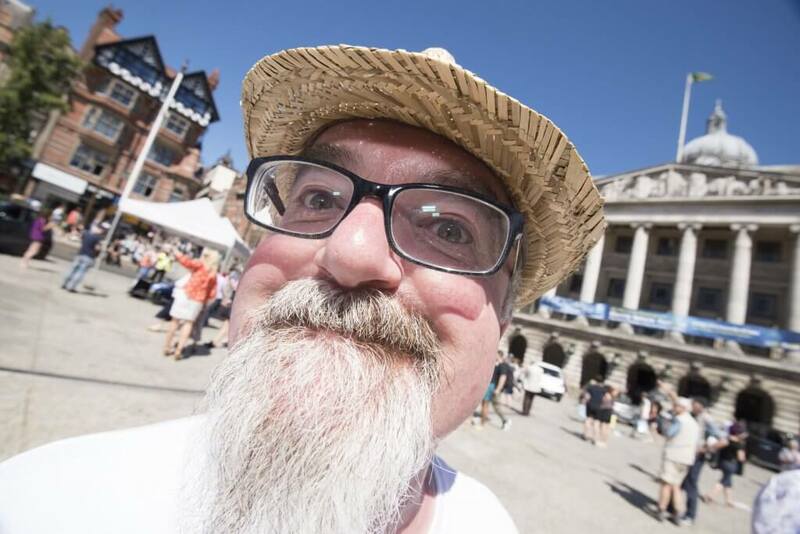 I’d just started working in the Go Ultra Low Nottingham project at Nottingham City Council and considered this was the right time to take the leap of faith and catapult head first into a new technology. Scary thought, but if part of my job was to persuade others to go ultra low emission I decided I needed to walk the walk, or drive the drive even. So we dutifully sat down and thought about all the reasons why we shouldn’t get an electric vehicle. We can’t afford an EV. They are more expensive than a ‘real’ car, aren’t they? Range anxiety. A new but medically recognised condition we heard. Would we need medication to treat it? The grandchildren. Three lively little tykes that need transporting all over the place, and electric vehicles are all small aren’t they? No off street parking. No way of charging it at the house! And with relief we thought “all that puts the complete kibosh on that idea” and we could just get a petrol one! Surprisingly, in our discussions about car sharing we discovered that friends Prakash and Joan, eight minutes down the road, had installed a charging point years ago, with the intention of getting an EV but not quite taking the leap yet. Scroll forward 12 months and our friends let us use their charging point in their garage. Our Kia Soul EV does a reasonable 120 to 150 miles on one charge. We don’t use the car massively and only need to charge it once a week at most, once a fortnight in the summer. To top it all, our friends have solar panels so it’s ultra green electricity we are using. Something we can feel very smug about indeed. So you get free electricity then? Not quite. Prakash is a canny business negotiator and worked out that each charge was using around £4 of his electricity. So we just set up a direct debit for £16 a month with him. That’s cheap for fuel! We were lucky enough to have friends who could help facilitate charging at home, obviously this is quite a unique situation and not everyone will be as fortunate. We have considered what will happen if circumstances change and we are no longer able to charge using Prakash’s drive. Now that we have lived with an EV we have a better understanding of how often we’ll need to charge and we’ve got past the ‘fear factor’ associated with newbie EV owners, so we don’t necessarily need the ‘safety net’ of access at home. The public charging network is expanding all the time and there are seven charge points in the car park 5 minutes away – so even without access to a domestic charge point we’ll still be able to stay fully charged. 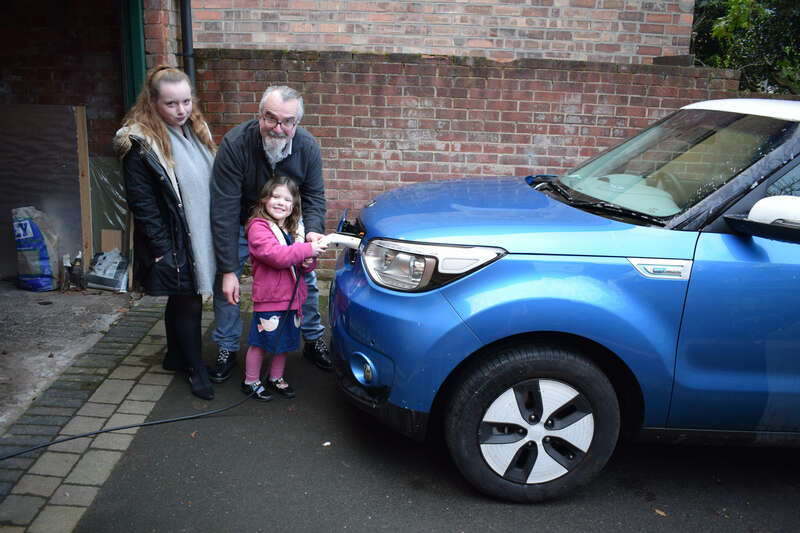 Header photo: Pete with two of his granddaughters Chloe Fallows (aged 15) and Grace Westacott (aged 4) – instilling a love for EVs from a young age!